“Fresh expressions of God centered celebration firmly anchored in the ancient tradition of Christian worship.” A worship leader's thoughts on worship, liturgy, and life. Get ready to sing along. We are all the worship team! Here are the songs we will be doing during our three services coming up this weekend. The links are to YouTube videos. I'm listing the songs with the artists who recorded them so you can also locate and download them from iTunes or Amazon if you'd like. Remember we are having three identical services this weekend. Looking forward to seeing you and HEARING you at one of them! We'll be singing the following songs this coming Sunday. Get familiar with the songs and then join the worship team this Sunday at 9:00 or 10:45 AM. Remember, we are ALL part of the worship team and God is the only audience. Blessings! I'm sure all of us have been moved by a powerful song or singer. 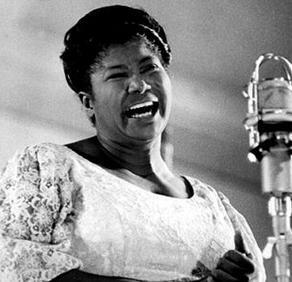 When I think of a singer who had the power to move people with her voice, I think of Mahalia Jackson (thanks Gio for putting her back into my thoughts). What a powerful voice! When we say someone is powerful, we mean they are able to move people to think or act differently. They inspire. Musical worship can be powerful in that sense. Somehow music touches us on a deep level. When we combine spiritual truth about God with good music and when we approach a time of corporate worship with an open attitude to be touched and moved by the truths we sing, we are often deeply moved and challenged. The interesting thing about powerful worship, however, is that it revolves around the recognition of God's power. Take a look at these words from the book of Revelation. Jesus Christ, is the highest power now because he gave up that power and became the slain lamb. He has earned His place of kingship and worthiness to be worshiped. But we also see here something about our power. Christ redeemed us to make us a kingdom of priests to serve God. First we are a kingdom. That means we share in Christ's dominion, or power to rule this world. But how do we rule? We do so in the same way Christ did. We become priests, who stand in the gap between a holy God and a sin damaged world. We lay down our lives, by giving ourselves in prayer, worship, and acts of love and service. It is when we begin to find how God has uniquely created us to be kings and priests that we find our true power. Our true power is really not our own. It is the power of God working through us as we present ourselves fully as a sacrifice of praise. How do we become a sacrifice of praise? It is by discovering who God made us to be; skills, talents, and abilities. We then sharpen the things God has given us and offer them back to be used by God for His glory and honor. Corporate worship is a time where we "rehearse" doing this. But there is the worship after the worship that happens between Sundays. We may be moved emotionally by powerful times of corporate worship, but does it move us to be the best stewards we can be of all of the gifts He has given us in our daily lives? If not, then the "rehearsal" on Sunday morning was not very productive. I'd encourage you to take about 12 minutes to watch this short documentary clip about Mahalia Jackson. Notices all of the ways in which she was moved to move others, not only through giving her all on stage, but in her simple daily acts of kindness and compassion. I am so blessed by the giving attitudes of those involved in the worship ministry at MCF. Unlike many other church worship ministries, we seem to have relatively little divisive conflict. Divisiveness on a worship team is always related to an unwillingness to become poor. Divisive conflict comes from attitudes of entitlement. Entitlement is a product of "wealth." By wealth, I am not necessarily talking about money. There is wealth of talent, wealth of skill, and wealth of knowledge, etc. Entitlement is an attitude that crops up when we feel that our wealth of whatever entitles us to certain privileges. Entitlement almost always plays out in pushiness or manipulation. This of course always creates division. In 2 Corinthians 8:9-11, Paul reminds us of the example of our Lord. This passage shows us the key to staying power in ministry. Staying power comes from giving up entitlement and, in a sense, becoming poor. If we give of our time, talents, skills, or knowledge and then feel we are owed something in return, we will often get discouraged and give up. Worship leading is about giving and not receiving honor. It is first and foremost about giving honor to God. That always comes in the form of honoring one another. In the video link below, I think Kim Walker does a good job talking about becoming poor and staying poor as a worship leader. In the last couple of years, she has become well known. In this culture, well known worship leaders are prized. They can almost make a career of speaking at worship conferences and leading in large venues. It is easy for them to become entitled by their superstar status and lose sight that it is about serving and honoring. Take a look at what she has to say. Although she does not use the word "poor," in what ways is she encouraging worship leaders to become "poor" and to stay that way? The first Sunday after Pentecost is known as Trinity Sunday. There is no perfect way of talking about the Trinity. But one way I like to think about our "God in three persons, blessed Trinity" is as a circle, or fellowship of perfect love and sufficiency. I hesitate to talk about this because it is easy to get into theological muddy waters. But in some sense, Jesus had to step away from this circle in order for the love that was found within it to be extended to us. I think Philippians 2:6-7 helps us to understand it a bit. If you will, Jesus became like us so that he could stand with us outside of the circle. But as a result, we have the means to be brought into the circle of love found in God; Father, Son, and Holy Spirit. Martin Luther King Jr. used to say, "Eleven o' clock Sunday morning is the most segregated hour of the week." Why is that? Could it be that many Christians who gather on Sunday mornings for worship have not understood how Jesus stepped outside to befriend those outside. We seem to have a hard time with that. We like our close knit circles where we "get" the values and cultural trappings of the others in the circle. But God's circle of love is not a circle of uniformity. The book of Revelation speaks of worship in terms of every nation, tribe, and language being represented (5:9 and 7:9). How do we get out of our little worship circles and stand on common ground with those outside? As the love of the Trinity compels us outward, the circle will enlarge and simultaneously become more diverse and unified. We will explore this topic of diversity in worship in more depth at the upcoming first Los Angeles Area Worship Gathering to be held at Rose City Church in Pasadena on Sunday, June 24th at 6:00 PM. If you have not done so, please mark this on your calendar. Check out this video by Richard Twiss on the Trinity, worship, and unity in diversity. As a seminary student studying church history, I wrote a term paper on the Azusa Street revival that originated here in downtown Los Angeles and began on April 14, 1906. Like the original day of Pentecost, Azusa Street spurred a tremendous outward spread of the Gospel that became known as the Pentecostal movement and the later Charismatic renewal movement that worked its way into evangelical, mainline protestant, and even Roman Catholic churches. Over 100 years after Azusa Street, Pentecostalism is still today the fastest growing edge of the Church and it is exploding in the global south. Pentecostalism is not afraid of miracles, signs, and wonders. They are front and center in that movement as they were in the book of Acts. However, as important as miracles, signs, and wonders were both in the ministry of Jesus and the Spirit empowered Church, they are not the main evidence of the Holy Spirit. Jesus made this very clear as we read in Matthew 7. Here Jesus tells us to pay attention to the fruit and not signs and wonders. Obviously Jesus is saying that signs can be faked, or perhaps even done by the power of a spirit other than the Holy Spirit. The wonders and miracles Jesus performed were signs that God's Kingdom had indeed arrived. Jesus' miracles were signs of the Gospel (good news). They signaled that a regime change was taking place. The old tyrant, Satan, who had called the shots over the world was being overthrown, and that through Jesus, God was becoming rightful King at last. In this new kingdom, love, righteousness, peace, and joy would be the new order. This was good news for the poor! Satan's kingdom, is based on selfish power grabs. As a result, there are always losers who must pay the price. The hungry, the exploited, the marginalized, and the poor are the most obvious victims of the kingdom of Satan (and the victimizers are also victims even if they don't know it). Jesus' ministry was primarily among the hungry, exploited, outcasts, and poor. His teaching and stories spoke of how, in God's kingdom, they were the blessed ones and His miracles were signs that what He said was true. In God's kingdom there is enough blessing to go around. Blessings are not just for the rich, powerful, and well connected. In fact Jesus made it clear that the types of blessings the rich and powerful enjoy are temporary and only fools spend their lives seeking them. So what does all of this have to do with the Holy Spirit? It shows us that the evidence of the Holy Spirit is not signs in of themselves. The true evidence of the Holy Spirit in action is the spread of the good news of God's kingdom to the poor. The cover of the most recent issue of Christianity Today magazine caught my attention. 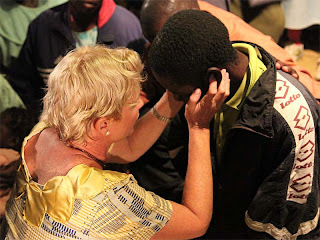 On the cover there is a picture of blond, Laguna Beach, California native, Heidi Baker (pictured above) stooped over a young boy in Mozambique, laying her hands on his head and praying fervently. The sub-caption reads, "The tireless Heidi Baker uses her gift of healing to serve the poorest of the poor in a forgotten corner of the planet." Bingo! There it is. The evidence of the Holy Spirit. Poorest of the poor. Forgotten corner of the planet. The good news of God's Kingdom being spread holistically to the poorest of the poor in a forgotten corner of the world. Heidi's ministry is marked by spectacular miracles. The deaf find that their ears have been opened and the blind see. Before you dismiss these miracles happening through the ministry of Heidi Baker as trickery of the poor and gullible, know that a study performed by Indiana University detected significant improvement in both sight and hearing of the deaf and blind after healing prayer by Heidi and her team in Mozambique. This same study team did not find the same significant results among North American faith healers. The evidence of the Holy Spirit is not the signs themselves, but the Good News being experienced in real ways among the poor and forgotten. Heidi's husband and ministry partner, Roland, exhorts believers to, "Seek out the most marginalized you can find." Heidi and Roland demonstrate that the Holy Spirit motivates believers to proclaim the Good News to the poor and when they do, the power of the Holy Spirit is made known in real and miraculous ways. Generally speaking, one of the main reasons we Americans don't experience the manifestation of the Holy Spirit is that we are hell bent on preaching a different "good news." We blend good news with prosperity, money, success, and achievement. In our corporate worship, the Holy Spirit has been reduced to something we feel. Worship leaders have been indoctrinated in the idea that we have to create an atmosphere where people FEEL the Holy Spirit (presence of God). Unfortunately, worship leaders and teams are evaluated on how well they "ushered in God's presence." This has led to a lot of manipulative techniques to drum up emotions that make people feel that they have had a Holy Ghost experience. But what if the evidence that the Holy Spirit has shown up in a worship service is not so much about what happens in the service? What if it is more about what happens as a result of the service? In Acts 2, we don't see the people gathered in the upper room going home afterward saying, "Wow, what a powerful experience. We've got to come back next week and try to make this happen again." Instead what you see immediately afterward is the Church being birthed as the Body of Christ to continue the work of Christ of proclaiming the Good News. We see the Gospel being preached. We see it being lived. We see people devoted to one another, praying together, growing under the teaching of the apostles, breaking bread and sharing at each other's tables, and those who had more sharing with those who had less. In fact we see an erasure of poverty among the believers (Acts 4:34). Talk about good news for the poor! The Church became a living testimony of what life under God's reign looks like. It was an attractive site which caused many to be added to their number each day (Acts 2:47). It is exciting to know that God's Spirit is still on the move in poor and forgotten places like Mozambique. But what about here in America? It's nice when we feel the Holy Spirit moving powerfully in a worship service. But it isn't a chill, or a warm sensation, tears of joy, or any other feeling that let's us know that the Holy Spirit showed up on Sunday morning. It is instead when we leave knowing the heart of God in such a profound way that we see the world differently. Our deepest desire begins to be that we would see God's Kingdom come on earth as it is in heaven. And it doesn't end with desire, but desire becomes a fire that motivates us to do something tangible, and often beyond our abilities and means, to make God's kingdom a reality. When we then step out in faith and obedience, the Holy Spirit gets to work and we begin to see miracles! This Sunday, let's not go into the worship service seeking some sort of Holy Spirit high. Instead, let's ask God for the Holy Spirit to reveal God's heart in such a compelling way that we have to do something about it when we leave. We know that there is a 50 day period between the Resurrection of Jesus and Pentecost. Scripture tells us that Jesus ascended into heaven 40 days after His resurrection (Acts 1:3). That is why Ascension Day is always celebrated on a Thursday 10 days before Pentecost Sunday. Most Christians these days, although clearly aware of Easter, may only be vaguely aware of Pentecost Sunday, but most likely will pass right by Ascension Day without any thought about it. But for Jesus' earliest followers, the Ascension was of utmost importance. Author and Regent College professor Darrell Johnson discusses the importance of ascension in the following three videos. Watch these videos during this 10 day period between the Ascension and Pentecost. Also the Global Day of Prayer has a great 10 Day Prayer Guide for use on the 10 days beginning on Ascension Day (May 17) and ending the day before Pentecost (May 26th). I encourage us to pray these prayers each day.